The Best Salesforce Developer blogs from thousands of Developer blogs in our index using search and social metrics. We’ve carefully selected these websites because they are actively working to educate, inspire, and empower their readers with frequent updates and high-quality information. Also check out Top Salesforce Developer Youtube Channels list for Top videos on Salesforce Developer. Salesforce Developer newsletter is a comprehensive summary of the day's most important blog posts and news articles from the best Salesforce Developer websites on the web, and delivered to your email inbox each morning. To subscribe, simply provide us with your email address. Facebook fans 326,982. Twitter followers 96,604. San Francisco, CA About Blog This is a community for Salesforce Admins to learn, connect and be inspired. It contains Webinars, blog posts and events for Salesforce Administrators. Facebook fans 32,655. Twitter followers 24,301. London, England About Blog Salesforce Ben is the leading Salesforce blog in the world, dedicated to covering news, tricks, certifications and career advice. Facebook fans 1,412. Twitter followers 5,020. About Blog Cloud for Good is a certified B Corporation and a Premium Salesforce.Org Partner specializing in donor management, case management, and marketing automation implementations for nonprofit organizations and higher education institutions. We help nonprofit organizations and higher education institutions create transformational value with Salesforce. Facebook fans 1,731. Twitter followers 4,645. Great Totham, UK About Blog The Blog is written by Keir Bowden. He is five times Salesforce Developer MVP, author of the Visualforce Development Cookbook, fanboy and also Salesforce Certified Technical Architect. Facebook fans n/a. Twitter followers 26,708. Jaipur,Rajasthan,India About Blog My Name is Piyush Soni, A High Spirited Salesforce Admin, Developer and a Blogger.The goal of this blog is to provide tips and tricks/workarounds for salesforce developer and admins I am just a guy who uses and loves Salesforce, and wants to help other people who use and developer Salesforce.com. Facebook fans 1,667. Twitter followers 189. McKinney, TX About Blog We are keen to bring our knowledge and practical expertise of Salesforce to you. Preparing the content, we focus on business owners, sales and marketing leaders as well as IT managers, and outline business problems that can be solved with Salesforce's key functionality. With every Salesforce article, you will dive deeper in the potential of this smart CRM platform and learn to employ it for business benefits. Sunnyvale, CA 94086 About Blog Algoworks is a leading software development company, offering complete services in Salesforce, Alfresco, CRM and ECM, including consulting, customization, integration and migration. Facebook fans 5,880. Twitter followers 5,193. Dublin, CA About Blog Mirketa Inc Blog is Perspective on Agile Practices, Cloud Governance and Salesforce, Microsoft Dynamics and Atlassian product implementation and customization. Bristol, UK. About Blog Our team of certified Advanced Sales force developers and technical architects can provide the skills and experience you need for your Sales force customization project. Using Apex, Visual Force and the Force.com platform, no solution is too complex. Atlanta, GA - Mumbai - Katihar About Blog Learn Salesforce process Builder, Visual Workflow, Apex and get Salesforce online training from the ​industry expert. Facebook fans 256. Twitter followers 507. About Blog Pardot B2B marketing automation by Salesforce helps marketers create more leads, generate more pipeline, and empower sales to close more deals. Follow this blog to know more about Pardot. Facebook fans 34,611. Twitter followers 70,558. San Francisco About Blog Salesforce.org puts the world’s best technology into the hands of nonprofits so they can create more impact. Facebook fans 17,586. Twitter followers 32,636. Hartford - Connecticut About Blog I’m Jitendra Zaa, a Salesforce MVP working on Salesforce Platform since 2008 and have 17 Salesforce Certificates in my arsenal.I have been a technical reviewer of many Salesforce books like Enterprise patterns in Salesforce, Introduction to Chatter, Visualforce cookbook, Mastering Salesforce CRM Administration etc. Facebook fans n/a. Twitter followers 3,084. Dallas, TX About Blog Follow this blog where Deepika Khanna provides online tutorials on Salesforce Administrator, Salesforce Developer courses and much more. Facebook fans 1,748. Twitter followers 122. India About Blog SFDCPoint provides Salesforce Tips & Tricks. Topics of Apex, Visualforce, SOQL, DataLoader, salesforce interview questions, salesforce certification. Facebook fans 2,226. Twitter followers 83. Singapore About Blog Follow this blog where Manish Thaduri a sfdc fanboy, a Salesforce platform specialist in Singapore with over 9 years of experience in Salesforce technology shares Salesforce solutions, product updates, tips, certification guides, code snippets, the latest trends and much more. Facebook fans 796. Twitter followers 871. About Blog I am Sakthivel Madesh, a Salesforce Advanced Developer & Advanced Administrator working on Salesforce Technology since 2011. I am very passionate about Salesforce and Love to Learn & Share my Salesforce knowledge to Salesforce Learners/Beginner using My Blog and Salesforce Community. Facebook fans 177,183. Twitter followers 64. Singapore About Blog I am a Salesforce.com Architect & Consultant working with Salesforce in Singapore as Program Architect. I love technology and I love Salesforce. Facebook fans 737. Twitter followers 105. The Hague, The Netherlands About Blog Everything about Salesforce. App Store with exiting applications, Daily updated posts to help developers. Facebook fans 906. Twitter followers 5. Nottingham About Blog We're a Salesforce and marketing automation company dedicated to helping you achieve your goals. If you've got a problem, we'll work with you on strategy, process, and workflows — then we'll design and build you a stellar user experience. Facebook fans 185. Twitter followers 353. About Blog Brought to you by Mike Gill, Ines Garcia, and Chris Edwards, this blog is by and for Salesforce community members. Facebook fans 354. Twitter followers 1,659. Eagan, MN About Blog My Name is Brett Nelson and I am a software developer chronicling my journey of learning and experimenting with new software development tools here at the WIPDeveloper.com. Follow this blog to get articles on Salesforce. Facebook fans 8. Twitter followers 3,034. Rochester, NY About Blog Metillium was founded in August 2016 after Luke worked as a Salesforce Technical Consultant and Tech Lead. Follow this blog where Luke shares his knowledge on salesforce. Michigan, USA About Blog I am Amit Chaudhary working on Salesforce Platform since 2011 and have 7 Salesforce Certificates.Working as Salesorce CRM Consultant. Expertise in Salesforce customization, Data Migration on Salesforce Org using Tools (Apex Data Loader, CLI) ,apex programing, work-flow,visual force,automated email alerts, dedicated workflow engine, administration, App Exchange Integration and much more. Facebook fans n/a. Twitter followers 794. About Blog I am working as a developer having around 3 years of experience. I like blogging which motivates me to create blog on various Salesforce topics. I believe in sharing knowledge,the more you share the more you learn. About Blog Santanu Boral is Salesforce MVP and 15 times certified. He is Salesforce certified Application Architect, System Architect, Platform Developer II, Sales Cloud Consultant, Service Cloud Consultant and much more. Follow this Salesforce Developer blog to get tips and tricks for learning Salesforce. About Blog A platform to learn salesforce, web development, crack interviews and excel in job. Louisiana, USA About Blog Sara Morgan Nettles is a Member of Team Trailhead/Pluralsight Author/Enhanced Computing Enthusiast. The goal of this blog is to support ALL developers wanting to explore the exciting world of cloud-based development on the Force.com platform. Pune, India About Blog I’m Biswajeet Samal. I’m a certified Salesforce professional and an experienced consultant. Facebook fans 193. Twitter followers 86. Virginia, USA About Blog Let's spread the Salesforce Ohana culture around the world in all our salesforce community friends and keep growing together. Facebook fans 3,548. Twitter followers 525. Nashville, TN About Blog I’m a Salesforce MVP, passionate about all things at Salesforce, Nashville Developer Group Leader and SalesforceU Certified. About Blog I'am Kolluru Sharan Kumar, Working as a Senior Software Engineer in Capgemini India Private Limited. I Have 2 Years of Experience in Salesforce. I worked on Salesforce Admin Configuration, Development , Salesforce CPQ, Salesforce Field Service Lightning. About Blog My name is Enrico Murru, also known as Enreeco. I'm a (ultra geek tech lover) mercenary software developer and Salesforce enthusiast. I'm also a Spring '16 Salesforce MVP, the first Italian ever nominated. Facebook fans n/a. Twitter followers 2,021. Palo Alto, CA About Blog Salesforce coding lessons for the 99%. Finally, Apex tutorials for point-and-click admins! Written by a self-taught Google engineer. Facebook fans n/a. Twitter followers 8,620. About Blog This Salesforce Blog is a developer’s experience in the Journey of Force.com development and customization. Akshay Dhiman is CTO of the company. He is responsible for all technical aspects of the company.He works with Executive Management looking forward the company’s growth. About Blog I am currently working for FinancialForce.com as CTO. Enjoying working and at times coding hard with everyone to make this new startup company a raging success! Along with our friends at Salesforce.com and UNIT4. I am pleased to have been selected as a Force.com MVP! Facebook fans n/a. Twitter followers 4,091. Kyiv, Ukraine About Blog The Welkin Suite is a new Force.com IDE providing powerful features for increased development productivity and comfort. Start using it today for free! Facebook fans 309. Twitter followers 3,581. About Blog Follow this blog where Lance Shi provides a comprehensive, intuitive guide to Salesforce coding by real word examples. This blog is for those who knows how to create objects and fields in Salesforce. Secaucus, NJ About Blog A place where you find answers to the most common Salesforce related questions. Facebook fans 1,817. Twitter followers n/a. Australia, Malaysia About Blog At WDCi we specialise in the Salesforce and Dell Boomi platforms. We build and integrate cloud solutions. We also build cloud applications that we sell on the Salesforce Appexchange. Facebook fans 92. Twitter followers 177. Facebook fans n/a. Twitter followers 2,707. Facebook fans n/a. Twitter followers 3,621. Chicago About Blog Mike Topalovich is a 9x certified Salesforce architect, developer and part time CTO in Chicago available for design & development initiatives on retainer. Facebook fans 114. Twitter followers 5,515. Harrogate About Blog I am a Force.com MVP and experience Technical Architect who has worked for a number of leading ISVs and Consulting partners. I am a Cetified Salesforce Developer, Advanced Developer, Platform App Builder, Platform Developer I and Platform Developer II. Facebook fans n/a. Twitter followers 2,498. United Kingdom About Blog The Audit9 blog is for cloud architects and developers interested in Salesforce, the Force.com cloud platform and related mobile and social technology.Blog authored by Mark Cane, Salesforce Certified Technical Architect, Certified Scrum Professional and former salesforce.com Principal Consultant. England, United Kingdom About Blog Migrating to Sales force from legacy systems, or needing some enhancements to your current configuration, let us help you! We have been a key part of the Sales force Eco-system for 14 years, and in that time we have found a lot of great resources that we think everyone should be aware of. Sandiego About Blog SaaSnic is Partner of Salesforce providing Salesforce apps and product development services and trainings. We specialize in salesforce integration, development and consulting Services dedicated to help the clients. Follow this blog to know more about Salesforce. Facebook fans 228. Twitter followers 2,064. New Jersey, USA About Blog Salesforce4u is a technical forum ,a key solutions provider for all development issues, provides services and support. Rajpura, India About Blog My name is Sagar Sindhi.I Started Working as Salesforce Developer Just Few Months ago and Trust me , Now I am Living for Salesforce .The Most Important Part that I like in Salesforce is Community. Facebook fans n/a. Twitter followers 648. Facebook fans n/a. Twitter followers 3,991. Whitehall, PA About Blog Hi, my name is Jesse Altman. I am a certified Salesforce.com Developer. My main focus at this point is Salesforce. I absolutely love the Force.com platform and spend as much time as possible developing in Apex and Visualforce. Facebook fans n/a. Twitter followers 4,711. London, England About Blog The On Demand Model: Multi-tenancy & Subscription. The benefit of coding in the CLOUD is that you learn how to write more efficient code and waste fewer resources. Noida, India About Blog The blog contains description about API in salesforce , Salesforce Lighting and many other things. The author has Salesforce experts trying to help the community, Vinay has outstanding understanding of Salesforce concepts and implementation experience of several Salesforce projects. Facebook fans n/a. Twitter followers 4,859. Bristol, United Kingdom About Blog SaaS Components is about the componentization revolution on the best SaaS platform. It brings to you everyday technical Salesforce news and articles. Facebook fans 1,494. Twitter followers 7,808. Facebook fans 337. Twitter followers 2,335. About Blog Annappa Ph is Working as a sales force developer in India. Follow this blog to get more information on Salesforce. New Delhi, India About Blog I am 3x Salesforce Certified: Salesforce Administrator, Pardot Specialist, Marketing Cloud Email Specialist, I did my first certification before my graduation. Speaker at Salesforce Developer and User Groups.Follow this blog to get more information on salesforce. Facebook fans 355. Twitter followers 1,822. About Blog A Salesforce guy & cloud evangelist and a Salesforce expert. Facebook fans 261,734. Twitter followers 5,830. Atlanta, GA About Blog 15 years of total IT experience in Development, Leadership, Architecture, Testing and Usability. Certified Salesforce Platform Developer. Facebook fans n/a. Twitter followers 25,620. New Jersey, USA About Blog Lead Developer at @CRMScience. Certified Salesforce advanced developer. Aspiring to be a @forcedotcom MVP! Bengaluru, India About Blog This is Shyam Nair, passionate Salesforce Developer, Technical Lead, Blogger and Trailhead Addict.I have been learning Salesforce since 2010, the time when no Trailhead was there, the time when we learned Salesforce by referring to PDFs, building Warehouse and Recruitment apps. Gurgaon, India About Blog I am a Salesforce Developer/Consultant I have 2.5 Years of Experience in IT Product Development. 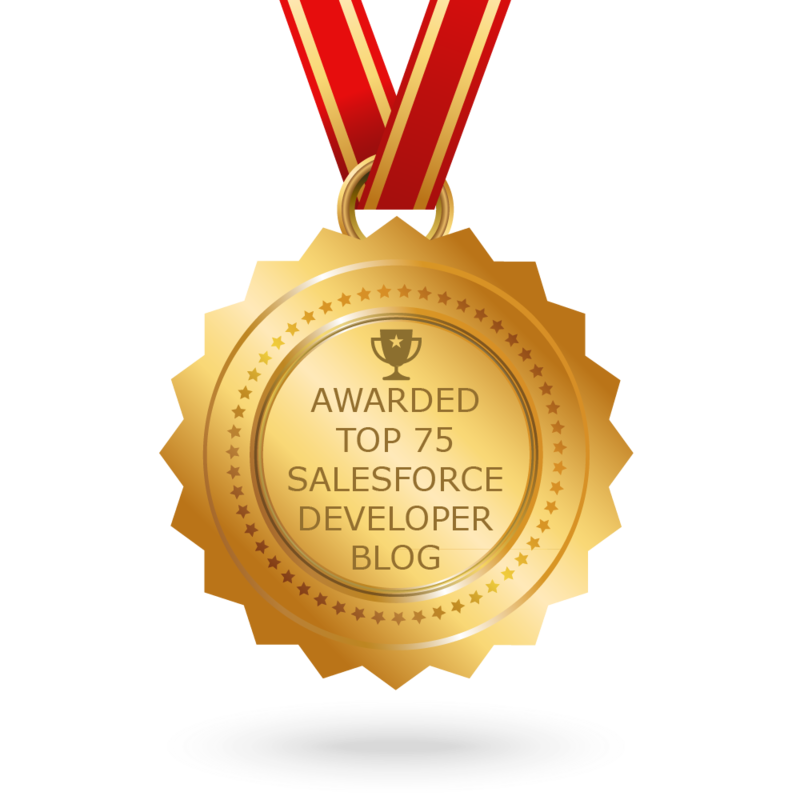 CONGRATULATIONS to every blogger that has made this Top Salesforce Developer Blogs list! This is the most comprehensive list of best Salesforce Developer blogs on the internet and I’m honoured to have you as part of this! I personally give you a high-five and want to thank you for your contribution to this world.